One of the most important things you will do for your rabbit is establishing suitable housing for him. You will make your lives together more harmonious if you establish something that works for both of you. Do not assume that you can train your bunny not to chew on cords. Some plants are also unhealthy or even poisonous to rabbits (see list in following section), so you’ll also need to prevent your bunny from getting to them. Some rabbits will also chew on baseboards, furniture and carpeting. This is especially true when they are initially exploring a new environment. If you have something you want to be absolutely sure won’t be sampled by your bunny, put it somewhere where he can not get to it. The best way to deal with your bunny's tendency to chew on your belongings is to give him plenty of alternatives that are more satisfying to him. These need not cost much money; in fact, most of the toys and treats sold in pet stores for bunnies are either not healthy for them, or not very interesting to them. Some of the chew toys that are popular with rabbits are listed below. Try enough of them to determine what your bunny likes. Willow and wicker baskets - untreated. Books - hardbound, paperback, phone books. Tree branches - Apple, willow, weeping willow and maple are favorites. Make sure the tree has not been treated with pesticides. Dry grass and hay woven toys. Plastic cat-toy whiffle balls, with and without “jingly” bells. *The dollar stores have some great large ones made from hard plastic which they will not chew up or eat. Cardboard boxes or rolls. Stuff them with hay to make them more interesting. Pen made from flexible storage cubes - can also use zip ties to better secure them together. 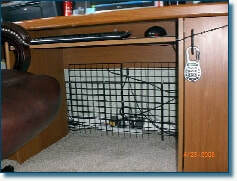 Flexible storage cubes used to block access to wires. 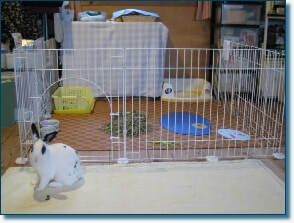 Rabbits can have free roam of a house or set of rooms, but many people utilize a pen or cage. Doing so requires that your bunny be outside the pen or cage for exercise, so you’ll still need to bunny-proof the room used for that purpose. If you are using a pen or cage, the best solution is to put the pen in the room used for exercise. The pen contains the litter box, hay and water, and serves to contain any associated messiness. The pen door remains open much of the time, so the bunny comes and goes as he pleases. But the rabbit can be confined to the pen when need be. Rabbits don’t do well in the heat, so make sure the pen isn’t in direct sunlight. Like most all other house pets, rabbits also do need a room with plenty of indirect, but natural sunlight. Room temperatures however should never exceed 75 Farenheit in the summer, and should not go below 50 F in the winter. As we also explain throughout our rabbit care guide pages, domestic pet rabbits should always live indoors and should never be let outdoors for any reason -- they pick up parasites and predator stress & injuries outdoors, and is something we never advocate or recommend for pet rabbits. Pens are generally preferable to cages. They can be larger, they are much easier to clean, and usually are less expensive. A primary requirement is space - lots of space. There needs to be sufficient room for the litter box, hay, water bowl and a hidey house, as well as for him to hop around a bit and lay down and stretch out. Most cages are too small to be suitable for a rabbit. Many pet stores sell cages for rabbits and even “bunny starter kits.” Most are not large enough for a rabbit. The intention behind many of these products is to induce customers to obtain a pet; that way the store will be able to sell you products for the life of the animal. It is in their interest to make it appear that the care and the housing of the pet will be minimal. This strategy is particularly prevalent with smaller animals, including rabbits. Flexible storage cubes can be used to make a good pen. The individual pieces are assembled to make the sides and top (if necessary) of the pen; hold the pieces together with electrical cord zip ties. They can be purchased at stores such as Target, Meijer, Home Depot, Bed, Bath and Beyond and the like. Look in the home organizer section. Doorways to the bunny's room can be easily blocked with child-gates or sections of the storage organizing cubes, which can be readily stored when not in use. 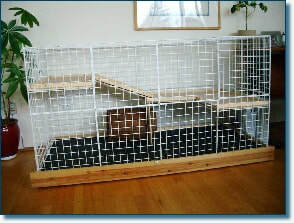 Exercise pens, available at pet supply stores, can be used to make a permanent pen for a rabbit. 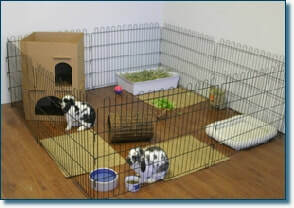 They can also be used to establish an exercise area outside the permanent pen, if you wish to restrict your rabbit to a portion of the exercise room. A piece of carpeting or linoleum flooring can be used underneath the pen; indoor-outdoor with rubber backing makes a good choice. This can protect the underlying carpeting or flooring and make cleanup easier. A piece of cardboard or linoleum can also serve as the bottom of the pen. 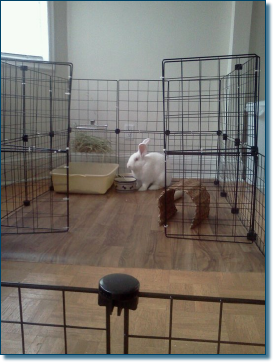 Large dog cages can be used for small rabbits who spend plenty of time outside the cage. *The cage bottom must NOT be wire! A wire bottom cage will result in sore hocks on your bunny's feet. These are very painful and can lead to infections. However, many rabbits are too large for even a large dog cage. Much of the room in the cage will be taken up by the litter box, water bowl and other items. Your bunny needs to be able to hop around quite a bit, and also to stretch out. Remember, he’s probably going to be spending a lot of time in the pen or cage. You need to give him enough space for his physical and emotional needs. Rabbits will want to use one or a few places for their litter and droppings. You’ll use this to your advantage in litter training. When your bunny first gets into his new home, he’s going to want to explore and mark it. So, his litter habits will not be as good as they will eventually become. Watch him during this time to understand his habits. If he seems to like one corner of the pen the best, put the litter box in that corner. Rabbits like to eat hay when “using the bathroom”. So, place hay where he can get it from the litter box. You can even put the litter on one end of the box and some hay on the other side of the box; be sure to replace any hay that becomes soiled. If your rabbit urinates outside the pen, clean it up with white vinegar. It will remove the stain and, as he won’t like the smell, discourage him from using that spot again. If the urine has dried, use a carpet cleaner as necessary. However, he will likely want a spot outside the pen. So, if he is persistent in using one spot, put a litter box there. The best way to encourage your rabbit to use the litter box is to make his entire pen, and any litter boxes that are outside it, his sanctuary. Make it a place where he knows he is safe and undisturbed. Don’t take him out of the pen or box - let him come out on his own. Don’t pet him while he’s in the litter box. Don’t place him in the litter box in a attempt to train him to use it. Let him know that the pen and litter boxes are safe places just for him. He’ll then be more inclined to use them. There is a technique you can use to aid in litter training. If he urinates outside his litter box, soak some of it up with a clean paper towel, without any vinegar. Put the paper towel in his litter box. Because it smells like him, it can encourage him to urinate there. Similarly, you can leave a small amount of the soiled litter in the box when you change it, so it continues to smell like him. Litter material made from compressed sawdust pellets, paper pulp or recycled paper (such as CareFresh or Yesterday’s News) or aspen bark are good choices. Do not use pine or cedar shavings as they can cause liver damage. Do not use cat litter or clay, as it is too dusty and harmful when ingested. Lastly, do not use corn cob litter; it’s not very absorbent and can cause internal blockage if your bunny eats it. Rabbit droppings make excellent composting material; they are rich in nitrogen. Inside Only - Never Outside! Domestic rabbits should live and exercise INSIDE the house. Rabbits that live inside become part of the family. A rabbit should NOT be taken outside for exercise or play time. Your rabbit can pick up ticks, fleas or fur mites very quickly. These parasites can do a lot of damage before you notice them. Also, your rabbit can be attacked by a predator, even if in an enclosed cage. Even if the predator can not physically get to your rabbit, your bunny will be very exposed and terrified during the attack. Your rabbit can be given plenty of exercise, stimulation and fun with the proper environment inside your house. There is no need to supplement that by putting him outside.